The Supreme Court is launching this year's applications for the 2019/20 Debate programme. Applications will be accepted from 31 January to 22 March 2019. For several years the Supreme Court have offered students a unique opportunity to sharpen their critical thinking, hone their debating skills and perhaps, launch their careers as lawyers, by taking part in a 'Debate Day'. 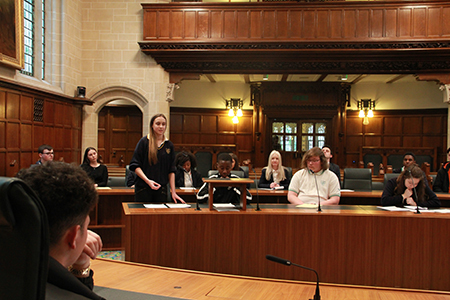 Students spend a day at court, with professional lawyers helping them to will prepare arguments from a choice of topics, such as religious freedom or 'stop and search', which are then presented in one of our courtrooms, with students being 'Appellant', 'Respondent' or 'Justice'. Last year we received over 40 applications from all across the United Kingdom, with eventual participants from Bristol, Wales and Northern Ireland. Applications must be made by teachers from accredited teaching institutions (schools or colleges) for the following year groups: Years 12 to 13 in England Wales, Years 12 to 14 in Northern Ireland and S5 and S6 students in Scotland. For more information please contact enquiries@supremecourt.uk quoting 'Debate Day'.